Patients taking the anti-clotting drug warfarin have been warned to limit or avoid cranberry juice consumption. 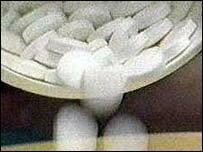 The Committee on Safety of Medicines is concerned that mixing the two increases the risk of haemorrhage. It has received five reports which suggest that cranberry juice acts to increase the potency of the drug. One man died after his blood clotting levels changed dramatically six weeks after starting to drink the juice. In a statement, the committee said: "Until this possible interaction between cranberry juice and warfarin has been investigated further, it would be prudent for patients taking warfarin to be advised to limit or avoid drinking it." Cranberry juice has boomed in popularity in recent years and is often used by women to prevent cystitis. However, it contains chemicals called flavonoids, which are known to inhibit the action of substances which the body uses to break down warfarin. Warfarin is used to prevent blood clots from forming or growing larger. It is often prescribed for patients with certain types of irregular heartbeat and after a heart attack or heart valve replacement surgery. However, it is known to interact with many other drugs, which either increase or reduce its potency. Modern anti-depressants, for example, can enhance the anticoagulant effect, while the herbal remedy St John's Wort diminishes it.